The information on the rest of this page is about the now defunct HAFC, not its replacement. Once we get accurate information on the new GCES including its availability and pricing we will do a separate review of it and reference that new page. 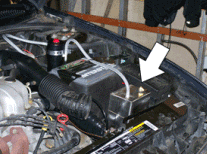 The HAFC, or Hydro Assist Fuel Cell, is manufactured by Dutchman Enterprises in New Jersey. As indicated on our comparison chart of top HHO systems, the HAFC is a "complete system" (includes an electronic enhancer) and it is also the ONLY system to guarantee a minimum mileage increase--in this case at least 50%. The photo at left shows the electrolyzer, or the fuel cell as HAFC calls it. 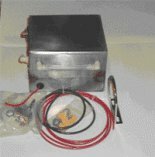 Photos below show other parts of the kit such as the fuel heater and the electronic enhancer module which make up the complete system. Also part of the HAFC kit is a fuel additive called a covalyzer which helps break up the gasoline molecules for more complete combustion. All of these items working together are what enable Dutchman to be able to guarantee at least a 50% mileage increase with the HAFC. It should be noted that this minimum 50% mileage boost guarantee applies only if installed by one of Dutchman's trained installers (check with your HAFC supplier for availability of a factory approved installer, and to find out the current policy regarding this guarantee at the time you order your kit). The fuel heater (called a vaporizer by HAFC) is made up of a cylinder lined with ring magnets and inlet and outlet fittings at both ends. The unit attaches to the upper radiator hose which supplies heat to raise the temp of the fuel passing through it. This helps vaporize the fuel into smaller droplets when injected into the engine's intake manifold for more thorough combustion. HAFC's patented electronic enhancer module, dubbed the Optimizer, is claimed to be "an actual computer...[which] teaches the manufacturer’s computer to operate the HAFC System to keep it from rejecting the savings". While it certainly is a proprietary design we were not able to determine that it is substantially different in function from typical electronic enhancers (EFIE's) on the market. The HAFC will typically run around $1000 for the complete kit, for an average sized engine (up to about 4.5L). For larger engines and trucks you should expect to be quoted more. Dutchman sells through a dealer network and prices may vary from one to another dealer. Also, this does not include installation. If you choose to have the system installed by a professional, add another $400-$500 to the cost.